This exclusive sketchup video is the part of sketchup skill builder series. In this sketchup video tutorial, you will learn how to perform version control in sketchup with the help of Trimble Connect. Version control means how you track diverse versions of your files as they develop. Trimble Connect offers a new way for designers, builders, owners and operators to collaborate, share, view project information as well as control the latest project documents, photos, drawings and 3D models via the cloud over the design, build and operate stages of a project. To learn the entire process, go through the following video tutorial. Wire Bending & Routing Tool is the latest sketchup plugin that is compatible with SketchUp 2016, SketchUp 2017, SketchUp 2018. The plugin is developed to serve different industries like Architecture, Construction, Education, Engineering, Heavy Civil, Interior Design, Kitchen & Bath, Urban Planning, Woodworking etc. This plugin is used to draw wire with bending on corners and illustrate perfect length of it. How does the plugin work ? If lines remain in group – explode or edit that group. In this sketchup video tutorial, you will be familiar with 5 different ways to cut holes and create openings in your sketchup geometry. You will learn how to use push pool tool in sketchup to cut holes very easily and efficiently. Next, you will learn how to apply intersect with model option to generate and eliminate faces. This options allow the users to connect cut out in different layers. In SketchUp Make, it is possible to make the effect of a subtraction with the use of the Intersect with Model command. If Intersect with Model is used, the two shapes don’t have to be solid entities rather Intersect with Model employs a dissimilar effect if your shapes remain solids. Then you will learn how to utilize cut components to cut openings in single thickness walls. After that you will learn how to apply DoubleCut to cut openings in double walls. Finally, you will learn how to employ the solid tools of sketchup pro to produce cut openings in your model. ​Watch the following video tutorial to get more clear ideas. Mario C has developed Mc-F3D. This sketchup extension is compatible with SketchUp 2016, SketchUp 2017, SketchUp 2018. The plugin is very effective for various industries like Architecture, Construction, Film & Stage, Interior Design, Kitchen & Bath, Woodworking etc. The plugin includes four new functions to the context menu (right button) to curtail the working time. The first 2 are utilized devoid of any limitations. The “Open” function needs the F3D dynamic components available on the developer’s site. 4 The new commands are included to the contextual menu (right-click) along with a toolbar. 1- Line to wall : Right-click on a line and provide the thickness and height of the wall to elevate from it. 2- Perpendicular wall : Choose a line and the face it borders, right-click and provide offset distance, thickness and length. 3- Windows : Instantly produce your windows as required. Auto naming. The dynamic component is no more required. 4- Opening : It should be utilized on F3D doors dynamic components. Right-click on the component to create the opening. Alternatively, the toolbar can also be applied. For online demonstration, watch the following tutorial video. a. Tape Measure Tool is used to scale a distance and fix exact guide lines or points. b. The Protocol Tool can use to scale angles and fix an exact angled guide line. c. The Measurements box waits to accept an exact value after using any kind of tool. This article will describe all the way to use Tape Measure tool, its speed and working areas and how easily it can make a perfect modeling. 1. Getting started with the Tape Measure tool: The Tape Measure Tool is found in the Tools menu of SketchUp or can get through some toolbars such as Getting Started, Construction or large Toolset Toolbar. Without all this there is the simple way to start the Tape Measure Tool by using the shortcut key T. After entering the tool the cursor automatically get the shape of a Tape Measure icon which has 2 measuring modes. The Guide Create mode will automatically activated after launching the tool and can be seen by the cursor’s figure. Users can also switch between Guide Create and Measure mode by using the CTRL key. 2. Using Measure Mode in SketchUp: This method is useful in accounting the measurements from a point to various points, ESC key is used to create new measuring point. This mode scales the whole model and using SketchUp’s Inference engine with arrow keys can change the measuring direction. Measure Mode can resize the whole model and a single object also. To resize them a group or component has to edit at first and then using the Tape Measure tool in Measure mode can resize the edited object. 3. Using Guide Create mode in SketchUp: This mode in the Tape Measure Tool is used to plan guide lines and points in SketchUp to firm draw in the workspace and various methods can apply for guiding drawings where the drawing can be done. Such as, A) infinite Guide Lines; it generally creates for gliding on an edge in SketchUp and can be created with double click. The distance between the lines can be measured only by entering a value against it. These lines can be arranged using array commands and create by placing a guide at the minimum distance and using the Move tool for copying the guide. B) Guide points; Guide lines can be ended with a construction point, at first an endpoint is picked after that measured direction and length will pick up. The endpoint is like the forcing tool into guide point mode that can create guide point at anywhere. Updated SketchUp’s inference engine knows every points to infer and combining with the Tape Measure Tool with it users can create all kind of guide lines and points in a moment. 4. 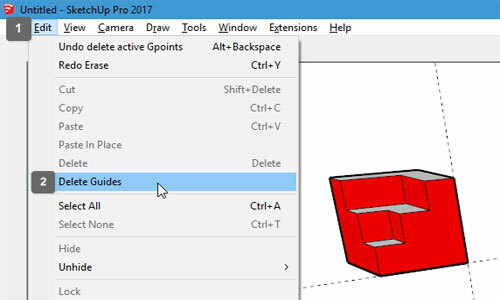 Deleting guide lines in SketchUp: The Select tool or the Erase tool help to remove the guide lines and points and areas. 5. Managing and deleting guide lines in SketchUp using Extensions: Using any kind of extension can make the way of managing and deleting guide lines simple and TIG’s Construction Line Delete via Context extension is available. It is useful as it can expand SketchUp with added more options by a right click on an existing Guide line. But this extension need to install in SketchUp and can found in the SketchUp’s ExtensuionStore. To install it got to the Search feature and type guide, the extension will appear with an install option just click on it and it will be installed. Installing and using this extension can give users access to more delete and layer management options to Guide lines and points through a context menu. There are more options find here to manage the guide lines and points. Split and join tools in SketchUp offer you the known applications correctly described by their names themselves. In this 3D application, LayOut Split and Join tools offer the easiest way to design a complex shape by splitting and joining. A few steps are there that help you do the needed cut and join on your design. Generally, split tool is for tearing a design apart while the joining tool joins one or more shapes together. • Select the Split tool by selecting tools > split. • Click on the areas of lines or edges you want to split. The splitting parts of the design can be dragged or dropped anywhere in the design. 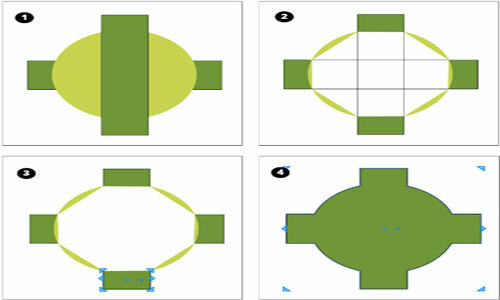 The picture below rightly presents how to use split tool for your design. The best thing is that you can use both Split and Join tools together to design a complex shape. If you want to use the tool in the best way, you have to go to the core and learn the basic part of this application. • Use the Select tool to drag the shapes and drop them so that they overlap each other. As it is shown in the Figure 1 (Callout 1). • Click the Split tool. • For Shared Vertex, you need to click on every overlap points. On hovering over the split cursor over these points, a red X and an Intersection ToolTIP will appear. • Use the erase tool to delete the unnecessary part of your design before giving your model a final touch. • Click the join tool to glue the split part to make a complete model. • Click on edge of each piece when the Join tool cursor is active. The color fills in the shape with every click. The fill color will be the color of the shape you click first. See Callout 4. The Split tool has many applications in our SketchUp design. Bending is another thing that is a popular feature for designers. Bending defines the curves of your design instead of the split points. For designing different complex structures, bending will prove a great tool. LayOut Path Editor is the tool that you need to bend the lines and shapes in SketchUp.